Sir - It is a fundamental fact of existence that we die, just a matter of how, why, and when (The euthanasia debate, Letters, Sunday Independent, March 31). The sentiments expressed by Dr Foley regarding the manner in which he would prefer to pass his final days would be echoed by many, yet the topic of euthanasia is a contentious one, with some individuals being of the mind that it could be used as a convenient way of disposing of the vulnerable. Indeed, the definition of the word euthanasia is the painless killing of a patient. But there is a difference between deliberately taking the life of another, and deliberately intervening to prevent a natural death. When life no longer holds meaning or enjoyment for the individual, with no prospect of a reversal of whatever the medical crisis is, doctors should not fear the consequences of a lack of intervention to extend life if treatment is against the wishes of patients or their families. A living instruction to that effect should be a right. Dr Foley is correct in saying that we need to debate this topic, and we need to have clear guidelines and legal clarity. Is it, or is it not, harmful to use medical intervention to deliberately extend the life of an individual who has no chance of recovery, if it is against their wishes? Lack of intervention in these circumstances should not be interpreted as euthanasia, what Dr Foley seems to be advocating is a public system that allows all people to die in peace, in comfortable surroundings, with dignity, and without unwanted intervention. This is not euthanasia, this is a humane compassion that should be a given in our society. Sir - In the context of Dr Michael Foley's letter (Sunday Independent, March 31) concerning human suffering and euthanasia, a friend of mine who suffered greatly from severe arthritis summed up her understanding of suffering's relevance in a succinct sentence. "Ni tadai e le hais an meid fhulaing mo Shlanaitheoir (It is nothing compared to the suffering of my Saviour)". In a similar vein, French philosopher Simone Weil corroborated this profundity in her stated conviction that Christianity gave meaning to human suffering in this life. Most, if not all of the great religions of the world share in this belief. Sir - Thank you to Dr Michael Foley for his letter on euthanasia (Sunday Independent, March 31). Yes, please let us introduce euthanasia and give people a choice about dying when their life is no longer meaningful and this is what they have requested. My dad is in a nursing home with dementia. I know this is not how he wanted to live. My mom had Alzheimer's and had many difficult years with no quality of life. Like Dr Foley, I expect to end my days in this undignified manner and don't want to put my children through this again. Please let us have a meaningful discussion and plan around these issues. Sir - Dr Michael Foley (Letters, Sunday Independent, March 31) wishes to debate the subject of euthanasia a propos his own demise. No doubt everyone would like to have control as to where, when and how they should die. The only surefire way this can be achieved is by deciding to end one's own life at a time, place and manner of one's choice. Better to do it now while in the peak of health instead of leaving the responsibility to others. Sir - The doctor advocating euthanasia as a solution for people suffering from terrible pain at life's end (Letters, Sunday Independent, March 31) is contradicted by a neuro-surgeon in the USA, Dr Eben Alexander. In his book, Proof of Heaven, Dr Alexander tells how he himself had a vision of peace and happiness in heaven - while he was in a coma some years ago. Proof of Heaven is a New York Times best seller. The story in detail is told in my book God Sense or Nonsense. Sir - Sinn Fein has never been more irrelevant as a political party as it has shown itself to be over the last few years. In Westminster's indicative voting last Monday night, Kenneth Clarke's proposal for a customs union with the EU, meaning a soft border, was defeated by three votes. Sinn Fein's seven votes, if it had chosen to support such a motion, would have seen it carried. I believe the people of this country are fed up with Sinn Fein's antics. 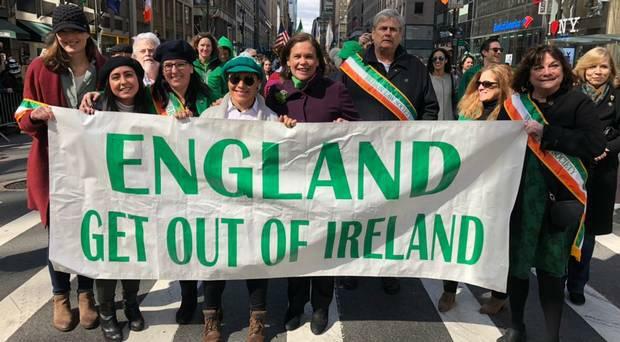 Its leader Mary Lou McDonald has apologised for walking behind a banner in the New York St Patrick's Day parade which read "England get out of Ireland". In a recent opinion poll, Sinn Fein's support has dropped five points to 13pc since the previous poll. I hope the voters in this country deliver a message to Sinn Fein in the upcoming local elections just as they did in the Presidential election. Sir - As we look at the present disagreement between the EU and the UK, people often forget the small matter of two world wars. Even to this day, I am often reminded of the battles and bombing that took place, as happens during conflict. One such battle took place just across the Irish Sea in the spring of 1941 when German bombers arrived over Liverpool and reduced the centre of the city to rubble, killing 4,000 people. People to this day still talk about this action. So please have some understanding of the mindset of the battle for minds and hearts over what is perceived as Europe's bullying of another country. Sir - It is beyond belief that the EU seeks to beg €10bn from the UK by way of dubious mafia-style debt collecting. Brussels has given itself an excuse to further crucify the democratic voters on the purest of ballots, a referendum. Are we aware yet in Ireland the type of monster the EU has become as we cringe before its every betrayal of morality and decency? Sir - It surely cannot be too long now before we are introduced to Brexit - The Musical. In the event of such a nightmare reality, may I suggest the suitable theme song for the event can only be Send In The Clowns. Sir - Brexit is happening whether we like it or not. However, the role of the DUP is unforgiveable. They have taken their 30 pieces of silver to support the loony Conservative Party. Yet they fail to recognise that Northern Ireland voted to remain in the EU - a region they purport to represent. They seem to have forgotten this as they parrot support for 'the precious union'. They have decided to close their collective ear to the pleas of local farmers and local business. May they reap the rewards of this decision at the next general election. Sir — In his opinion piece (Living, Sunday Independent, March 31), John Masterson speaks of his search for the essence of Christianity. At the heart of Christianity is the belief that God is love; that he loves us more than we could ever love ourselves, and more than we could ever imagine ourselves being loved. It means believing that God wants what is best for us, that he knows what is best for us, and surprisingly that he is here and now, delivering on what is best for us, even though we spurn him. With one’s heart aglow from this wonder of God taking such an interest in me, it becomes possible to both appreciate and appropriate (both personally and as Church) Jesus’s dying for us, his resurrection, and that issuing forth of his holy spirit. Yes, Christianity stands or falls on the resurrection of Jesus Christ from the dead to his heavenly father, but our faith is awakened by the wonder of having been so undeservedly loved by him. It is his love that so shapes our souls, that we may believe. Sir — John Masterson’s piece on why we ‘‘choose to be good’’ was very interesting. Recent neurological research, therapeutic developments and spiritual teachings are all pointing towards the idea that ‘‘goodness’’ (for want of a better term) is our natural, innate state. It’s a ‘‘place’’ within us. A place from which we are kind and ‘‘good’’ to ourselves, and to everyone else. Not because someone told us to be, or because we think that’s the ‘‘correct’’ thing to do, but because that’s who we truly are. The problem is, there’s so much confusion and so many disturbing events in the world that we forget this. When we can acknowledge troubling thoughts and emotions and let them go, we naturally return to our true compassionate selves. Meditation, mindfulness and similar approaches can help tremendously with this. Sir — It is astonishing, or should that be outrageous, that there can be hundreds of patients on hospital trolleys around the country and this is still not considered a national emergency or crisis. Maybe diminutive Australian songster Kylie Minogue would really enjoy hearing from a politician here and give her authoritative views on such a dire situation. Then again, I should be so lucky! Sir — The second coming of Mick McCarthy as manager of the Ireland football team has saved the FAI blazers from becoming a national laughing stock once again. There was no soap opera surrounding the signing of his contract. There were no feuds with leading players or premiership managers whose goodwill was vital. Journalists were not hectored for simply trying to do their job by asking legitimate questions. First time round, a leading player seemed to have more respect for his dog than his manager. Mick McCarthy also stood up for himself when asked by RTE about a sponsorship deal between the FAI and a firm of bookmakers, in the middle of a week-long saturation coverage of Cheltenham supported by Boyle Sports. I think it’s time for new balls, please, and game, set and match to the plain-speaking miner’s son from Barnsley. Sir — I am a qualified Irish primary school teacher, living in a three-bedroom house in a council estate with my parents, my brother and my 17-year-old son. I worked hard to become a teacher and thought my diligence would pay off. Alas, in a country where the rich will always be rich, and the poor always poor, my aspirations were fantastical. I’m disgusted by the housing crisis and the notorious number of more than 10,000 homeless in Ireland. Add me to that number as the “unseen homeless”. There are many more of me besides. I’m the middle-income earner paying for Leo Varadkar and his cronies’ suits as they attend summits that cost the taxpayer €19,000. I’m tired of being quiet and accepting the status quo in this country. It’s time the Irish people woke up and stopped accepting the corrupt policies of the political elite in this country. Some French brawn is a necessity at this point. If anybody was ill, they went to local hospitals mostly run in an exemplary manner by the nuns. Nobody complained about this. However, in recent years, things began to change. Firstly, the nuns were moved out. This was followed by the removal of all religious symbols from hospitals. Worse was to follow. Now they want religion banned from the school curriculum. RTE, not to be left out, now treats us to ‘the people’s angelus’ where there is no reference to, or symbol of, religion of any kind. The people who object to our customs should remember that they are not held here against their will, and are free to go to a place where their beliefs are practised. Sir — With all the misinformation about schools losing their ethos and beliefs, there have to be compromises. The North of Ireland, where 90pc of schools are segregated, shows the problems of non-integration and hatred, and fear is rife. The ‘Island of Saints and Scholars’ is a long way from the present situation and all parents know when they send their children to a school what its beliefs and ethos are. All beliefs can be catered for if it is done in a caring and meaningful programme. I am from a smaller religious sector and remember being told to study something else as the majority of the class were given religious education in their religion of Roman Catholicism. I don’t think it was detrimental to my well-being. Sir — Roll up, roll up! See the greatest show on Earth! For those cave dwellers who don’t know it yet, the US Masters Golf is the greatest show on Earth. It is played every year at Augusta, Georgia, in what is God’s own garden and a contender for “wonders of the world” status. Then you have the competition. It is not an ‘open’ as such but players qualify via their standing in world golf. These superhuman, Godlike golfers never fail to produce an exhilarating, masterful display of the true ‘beautiful game’, culminating in the usual gut-wrenching, nailbiting back nine on ‘Masters Sunday’. I will go to bed on Sunday night truly shattered as I will have hit every ball, sunk every putt along with Rory McIlroy. I will have laughed, cried, shouted myself hoarse. But I will go to sleep, once again helping him play the famous ‘Amen Corner’. If he wins, I surely deserve a handsome portion of the cheque?